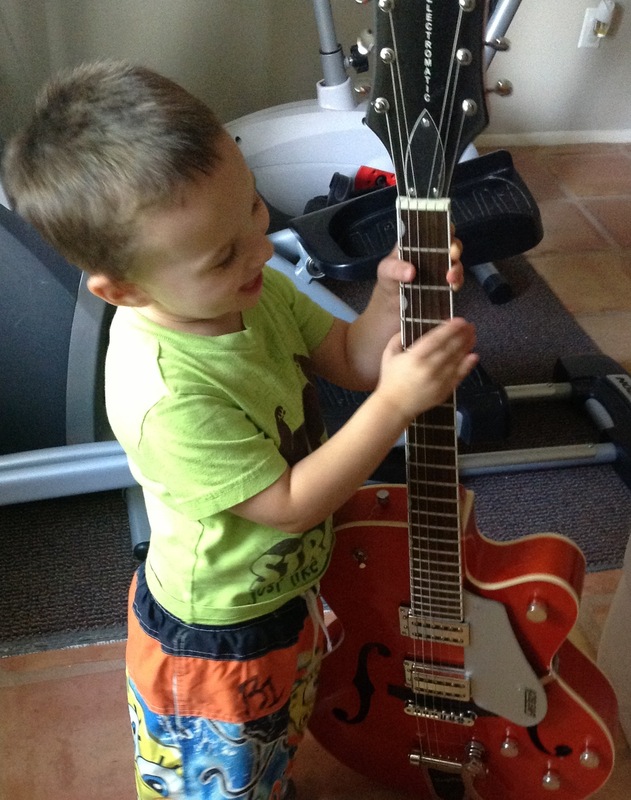 So far, I can’t tell if you’re the kid that will have more of a musical inclination. It could be Micah, right now he likes to sing more than you do… or you could both have the same level of appreciation. All I know is that with your mother, and her dad around, no one’s getting away with with being a casual fan. If I had to guess, I’d say I’m addressing this letter to the right son based on your tendency to sneak into the office to get a few strums on the guitar in when we’re not paying attention- or the fact that you walk around the house like you have your own internal soundtrack playing. I also don’t mind the fact that you’re always up for a Foo Fighters marathon. The reason I’m writing this letter is to pre-acknowledge that you will make some music appreciation choices that I am unable to understand based solely on our 25 year age difference. You already find hours of entertainment listening to K-Pop, and “Gangnam Style” a hilarious skid-mark in the underwear that is pop-culture. Frankly, I don’t get it- and I shouldn’t get it. Imagine if there was no parental uprising against the musical stylings of Elvis Presley- kids wouldn’t have found him to be a rebel, because there was nothing to rebel against. Will “Gangnam Style” stand the test of time like Elvis? No way in hell. Still, the overall point is that in order for a new generation to fully embrace something, it has to be at least partially rejected by the prior generation. I try to remain relatively open-mind about music. I love the early/mid 90’s because that’s when music played the biggest role in my life. My dad liked classic rock groups like REO Speedwagon, AC/DC and Bad Company. My stepmom was into the top 40 of the moment like Amy Grant and Elton John. Their compromise for long car rides always seemed to be deep-voiced femme-rockers like Heart, Tina Turner and the Eurythmics. I didn’t mind any of their choices, but you can be sure they minded some of mine. Rap-rockers like P.O.D. And Linkin Park’s records usually didn’t get many spins in the Toyota Sienna. They may not have embraced my choices in music, but I took theirs, as well as your mother’s affinity for great modern songwriters, and I feel like I have a healthy appreciation for most genres. The one at I’ve yet to wrap my head around, however, is the electronica/DJ personas that seem to continue growing in popularity every year. Some of these people have real musical talent, but the things they produce and perform display a different kind of talent… One without the term “real music” in it. Should you be able to play an instrument, or sing/vocalize something to be considered a musician? I think so. In the same way that I’m not sure it’d be fair to call yourself a brilliant cook for adding ketchup to an already-made burger, I don’t think manipulating the sounds of an instrument you can’t play acoustically qualifies you as a musician. We were at a show in Las Vegas last night, and the opening “band” was a couple of guys who looked like they were dressed for a long day working at the fish market. Even though there were two of them, they went by the name John Talabot. I’ll assume John was the one that said more than 3 words during their set. He looked like a younger David Arquette, and for a minute, I thought this whole “performance” might have been Arquette playing a prank on all of us. They stood at their workstation, twisting nobs with the enthusiasm of a prisoner being made to peel potatoes, and it wasn’t until they were finished with their first “song” and thanked us for being a great audience that I realized they were a musical act and not stage techs sound checking for the next group. I stood, bewildered as they went through 5 more songs that involved them pushing the play button on looped tracks, repeating one sentence in monotone fashion, and periodically hitting a drum pad. A Persian kid with a Jheri curl and a tweed jacket aggressively dancing nearby became my primary source of entertainment as the onstage duo never even bothered to show 1/100th of the enthusiasm that this weird little man did. I don’t mind the fact that you’ll consume music that your mother and I will inevitably and naturally despise, but please don’t try to pass anything like the duo described above as the music that we don’t understand due to our generational divide. Electronica is a type of music like Doritos are a primary source of nutrition, and DJs are musicians like homeless guys who clean car windows with newspaper are auto mechanics. It sounds harsh, but when’s the last time a cartoon character won a best-actor award? Same thing here, this is musical animation, not the real thing. The whole point is this, make sure the crap you like is actually worthy of being called crap.